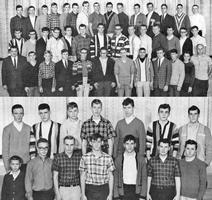 Bottom Photo Row I (LtoR) Jim Postl, Tim Herman, Dave Thompson, Paul Kuntz, Buddy Gessler, Jim Alber, Jerry Robarge. 1964-65 was an exciting time for Tomahawk athletics. While the football team struggled to a 0-7 season, the basketball team had a respectable 13-6 season. Wrestling started in its first year, while baseball shared co-conference champions and boys track won their third straight conference title and first sectional title sending 13 individuals to the state meet. Bob Meyer and Bill Fischer, sharing track coaching responsibilities, were heavily involved in Tomahawk athletics. Bob was an assistant football coach, head wrestling coach and a track coach. Bill was head basketball coach and a track coach. These two coaches along with over four dozen athletes produced a season to remember. Members of the 1965 track team were Ron Faust, Ralph Johnson, Neil Whitaker, Tom Petta, Vince Alber, Gaylin Raab, Jim Hilbert, Walt Binder, Bill Schiltz, Grant Graeber, Jerry Paukner, Dennis Burgy, Phil Beiler, Dan Voermans, Hal Gaedtke, Don Mueller, Peter Trantow, Fran Higgins, Steve Johnson, Gary Hoffman, Oscar Copes, Mark Alberg, Tim Theiler, Craig Kuntz, Greg Venne, Jim VanRyen, Joe Radcliffe, Bill Lovshin, Lauren Erickson, Andy Beiler, Steve Gaedtke, John Mott, John Feind, Milton Larson, Bill Smith, Dan Schiltz, Otto Yirkovsky, Richard Loveless, Ed Steigerwaldt, Dennis Theiler, Jim Postl, Tim Herman, Dave Thompson, Paul Kuntz, Buddy Gessler, Jim Alber, Jerry Robarge, Jim McCarthy, Mike Johnson, Harry Copiskey, Gary Gould, Al Whitaker, Rod Gaedtke, Allan Hetzel, and Mike Timm. The season started with four straight dual meet wins, with Tomahawk defeating Lakeland 75-43 and 89-29, Phillips 91-27, and Crandon 190½-8½. These victories added to a dual meet streak dating back to the 1962 season. At the Medford Invite, the competition allowed both coaches and athletes to discover how to be competitive with a very strong Mosinee team, coached by Bob Coy. When the invite was over Mosinee was champion with 68 points, while Medford scored 58, Tomahawk 44, Park Falls 25, Phillips 8 and Lakeland 8. Though placing third, Tomahawk had the potential to be a much better squad pending dedication and belief in themselves. The question remained, was just how far could they go? More pieces to their identity would emerge when they placed second at a quadrangular in Rhinelander. Rhinelander won the meet with 59 points, while Tomahawk scored 53½, Antigo 47 and Merrill 38. Placing second here was no disgrace as these Valley schools forced Tomahawk to step up to the next level of competition. Belief in the fact that they had found the events for each participant that would give them the maximum points, Tomahawk went into the conference tournament with the goal of defeating Mosinee for the title. Borrowing a compact roller from the local paper mill, Bill Fischer once again had the cinder track packed and ready for competition. One could say that being at home was to Tomahawk’s advantage as event after event had two very strong teams battling it out for the conference crown. Mosinee and Tomahawk performed extremely well and managed to get the maximum points that they could, with the outcome hinging on the last event, the 880 relay. Appearing that Mosinee was going to win, an exchange violation disqualified them. A ref from Rhinelander, who was a former track coach at Mosinee, made the call sending Mosinee coach Bob Coy into an emotional frenzy. This disqualification gave Tomahawk the team title by a ½ point win with 69 points, Mosinee 68½, Medford 38, Phillips 16½, Park Falls and Lakeland with 8½ points. Winning the title was a result of Tomahawk being a competitive team that found a way to perform at this high level in front of the home crowd. All-Conference 2nd Team honors went to Mike Timm (broad jump), Phil Beiler (440), and Tim Theiler (high jump). All-Conference Honorable Mention went to the Mile Relay Team of Gaylin Raab, Craig Kuntz, Dan Schiltz, and Phil Beiler, John Mott (100), Mark Alberg (high jump), and Bill Smith (880). What Tomahawk had accomplished in the conference would not be duplicated again until 1995. Momentum continued going Tomahawk’s way as they definitely hit their peak at sectionals scoring 52 points to Mosinee’s 44 points and giving them their first sectional title in school history. Leading the way at sectionals were first place finishes from Gary Hoffman in the high and low hurdles, Hal Gaedtke in the pole vault, Peter Trantow in the mile, and Fran Higgins in the disc. Also punching their ticket to state was second place finishes by Tim Theiler in the high jump, Don Mueller in the disc, Mile Relay Team of Gaylin Raab, Craig Kuntz, Dan Schiltz, and Phil Beiler and the Half Mile Relay Team of John Mott, Jim Hilbert, Phil Beiler, and Steve Gaedtke. Tomahawk sent 13 individuals in 9 different events to the state tournament, a truly amazing feat! A competitive conference and sectional may have taken its toll on Tomahawk as the only individual to place at state was Peter Trantow, placing sixth in the mile event. Tomahawk was pleased with their results but mentally and physically exhausted. In retrospect, Tomahawk had made great strides from the official beginning of track in 1957 with Bob Meyer and Otis Mehlberg. By 1965, Bob Meyer and Bill Fischer had established a very competitive program that had left their mark on Tomahawk athletic history.